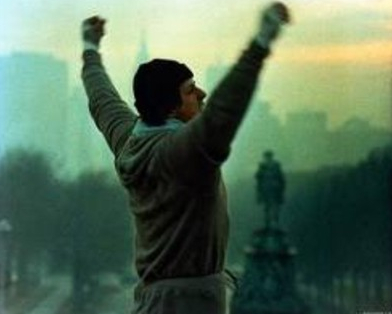 I have a picture of Rocky as my desktop image — a still from when he’s just run through Philadelphia in his gray sweatsuit and black wool cap, sprinted up the steps of the Philadelphia Museum of Art and triumphantly raised his hands in the air. This is to make me believe I can do this. I am working on a book, and I’m maybe about halfway through. It came about as a result of winning a national non-fiction writing contest held by Glamour magazine. Along with a 5K prize came a very fancy lunch (including a carrot marshmallow amuse bouche) with Glamour editors and some interest in my work from agents in NYC. So I decided to keep writing essays, enough to put together a collection. It’s going to be called The Saltwater Twin and Other Mythical Creatures. (More on that later.) So here I am, about a year in and halfway through and it is sometimes hard to keep believing that I will make it up the steps. (And that’s just the writing the book part; then comes the publishing journey.) So I have Rocky on my desktop. Also my friend Lindsay who believes this will happen. Sometimes it’s helpful to have someone believe something for you when you’re finding it a bit impossible. And, I suppose, to be a little bit thrilled about the small achievements along the way…every step. you rock maia! i’m going to try to use the term amuse bouche as often as possible. i like saying it. it feels like i’m puckering up for a kiss…twice.